So what do the Utes say? All in or in the way! A sign bearing that mantra hangs above the door from the locker room to the field, and players slap it on their way out of the tunnel on game day as a reminder of the commitment required to be a part of the Utah program. The Utes have bought into Whittingham’s system, and they are definitely all in. They are in this together. They are in this for the long haul. They are in a family that looks out for each other and takes care of each other. Utah is a perfect example of what Aristotle meant when he said “The whole is greater than the sum of its parts.” The Utes do have some great players, but so do most of the teams playing in Power 5 conferences. What really sets Utah is apart is how well the individual players come together and play as a team. Say what you will about particular games, drives or even individual plays — you just can’t argue with the results. While teams often run hot and cold, and dominance of the Pac-12 can be fleeting, there can be no dispute that currently Utah is the class of the conference. The No. 4-ranked Utes are the only undefeated team left in a very competitive Pac-12 Conference in which there is so much parity that it appears virtually any team can win on any given day. What Utah has accomplished thus far has not been lost on the rest of the nation. There are 14 undefeated teams left in the Top 25, but only three (Ohio State, Baylor and TCU) are ranked ahead of the Utes. In fact, Utah had more first place votes (16) than any other team but Ohio State (27). The Utes are also getting some props from a somewhat unexpected source. Forget Motown, Utah has the MoTab (and contrary to popular belief, they are Utah men)! It truly warmed my heart to hear the Mormon Tabernacle Choir sing the Utah fight. 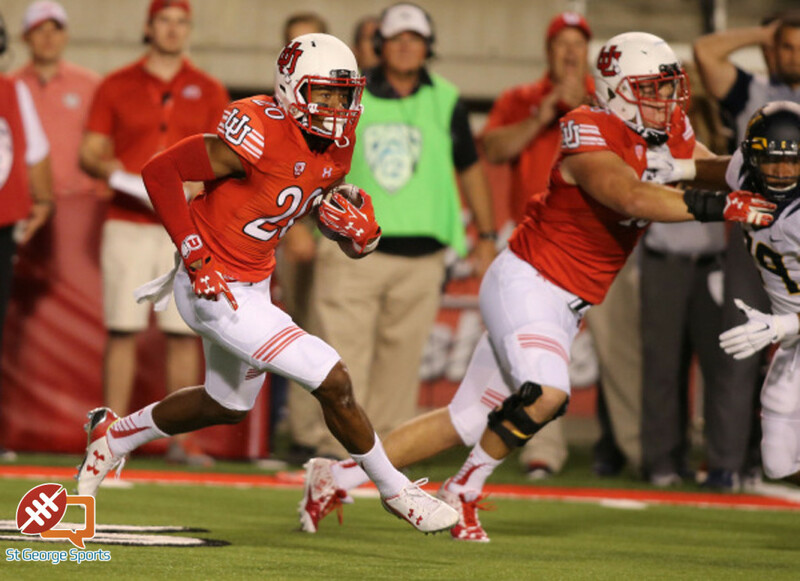 Saturday night was a typical blue-collar win for the Utes. Utah had to work for the win all night long. Trailing by only six points, Cal had advanced the ball to Utah’s 21-yard line with less than a minute left and a chance to take the lead with a touchdown. The Utes held firm, the Bears turned the ball over on downs and Utah secured its fifth win in as many games. Notwithstanding the six turnovers (five interceptions and one fumble) forced by the Ute defense, the Utah offense was only able to convert those turnovers into 17 points. The naysayers point to that stat and claim the Utes were lucky to win the game. I respectfully disagree. TCU was lucky to win after allowing unranked Kansas State to rack up 45 points against the Horned Frogs. Michigan State was lucky to win after allowing a 2-2 Rutgers team to lead for much of the game. Cal was lucky to only lose by 6 points after giving up six turnovers. Utah won a gritty game against a quality opponent that was undefeated and ranked 23rd entering Saturday’s contest in Salt Lake City. The fact that the Utes can find a way to win against a quality opponent, even when all facets of the team are not performing at peak level is a characteristic of a special team. Speaking of special teams, they had far less of an impact for Utah on Saturday than they have had in previous games, but the defense picked up the slack. The passing game was less than impressive, but the running game was very impressive. Devontae Booker was simply a beast. Booker finished the night with 222 yards rushing, with many of those yards coming after contact. After factoring in another 45 yards receiving, Booker accounted for 267 of Utah’s 435 yards of total offense. Opposing defenses are going to key on Booker and make it difficult for him to have such a dramatic impact every game. However, that is where the team concept comes into play. The Ute offense has proven it can be explosive, and I look forward to seeing more fireworks in the coming weeks. While my bright-eyed and somewhat anxious 9-year old daughter is starting to merrily sing the refrain, “It’s beginning to look a lot like Christmas,” I am singing a different song: “It’s beginning to feel a lot like ’08.” There were plenty of haters back in 2008 too, but Utah still persevered and capped an undefeated season with a big win over Alabama in the Sugar Bowl. But alas, once again I am getting ahead of myself. There is still a lot of football left to play, and Kyle Whittingham will be the first one to point that out. Next up is another late Saturday nightcap in which the Utes host 4-2 Arizona State. The Sun Devils handed UCLA its only loss of the season two weeks ago and beat up on Colorado last weekend. This is going to be yet another challenge for Utah as there are no gimme games left on a very difficult Pac-12 schedule. Here’s hoping the Utes keep the magic alive with another electric win over a very good Arizona State team.